**ADOPTED** TAZ – handsome Red Staffy! Taz is a stunning red Staffordshire Bull Terrier who is approx 4-5 yrs old. He came to us as a stray, and wasn’t in the best condition – he was very underweight and had a flea allergy which caused some fur loss, but despite this he is a typical super friendly Staffy. He is now looking and feeling much better and has been given a clean bill of health by our vet. He has a great personality and is generally quite laid back, but does love to play with his toys!! He has been fine around other dogs and could possibly live with a friendly female dog in his new home. Taz walks nicely on the lead and is good off the lead. He is also fully housetrained. We are looking for a home where he’ll lots of company to make up for what he missed out on in his past life, but he is fine to be left for a couple of hours. He’s great with kids, and has happily been around children as young as 3, but we are looking for a slightly quieter home for him as he does like peace and quiet! 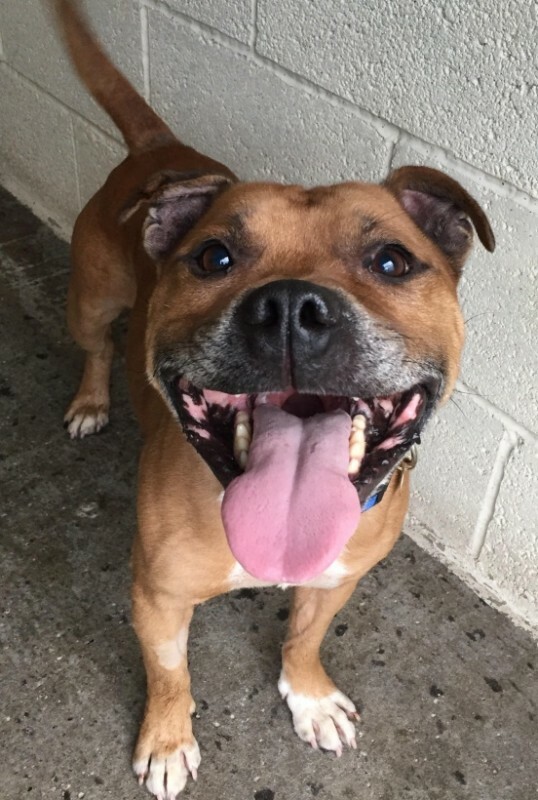 Taz is an amazing boy and is looking for his dream 5* forever home who know and love the Staffy breed!